As runners we all love our shoes, unless of course you are from the barefoot running crowd. Barefoot running and minimalist shoes interest me, but I am still in the hmmmmm phase. Today Mizuno launched the new Wave Prophecy in one of their biggest shoe launches to date. I personally have not run in any Mizuno shoes, but my daughter's have, and have been very happy with their shoes. The Wave Prophecy is a very cool looking shoe and will be sure to turn some heads and prompt some questions. With the new infinity wave plates the shoe has a unique look, and one that will at first make you question what kind of support or cushion the shoe has. The Wave Prophecy debuts the first full-length Infinity Wave Plate, a breakthrough that was seven years in the making. The full length Infinity Wave Plate in the Wave Prophecy is an industry first in that in allows Mizuno designers to fine tune each individual section of the midsole, resulting in a unique heel-to-toe feel. This innovation provides runners with a dynamic and forward propelling movement that works in harmony with the foot. The Mizuno Dynamotion Fit™ feature provides extreme comfort and protection through its slipper-like feel of the stretchable mesh fabric. The AP+ Midsole assists in the forward propulsion and bounce of the shoe, while the SmoothRide™ flex controllers built into the Wave plate in the forefoot minimize energy loss during toe off. Additionally, Gender Engineering™ allows Mizuno to create a high quality and custom fit running shoe that meets the specific and varying needs of both men and women. How do you choose your next pair of running shoes? Does design play a part? If so, how big a part of your decision making is the style and coolness factor? I'm intrigued by them as well. I've been in the Mizuno Wave Creations for my past 3 pair (just 'upgraded' to the model WC-12), though from the video, they appear to be designed more for heel-strikers, of which I'm not. Yet, I suppose the Wave Creations are designed similarly but I absolutely love them, being they're also touted as supportive for larger runners. It seems to me that this is endorsing a heel strike. With reading this post, I've linked the video on Twitter to see if anyone has anything to say about that. it is mentioned and provide a link to it. I was just reading that on their site. Kind of like an "everyman" shoe in a way. Not sure I like that, but when it comes to shoes its all a matter of personal preference anyway. The important thing is to find what works for you. Interesting. I've been wearing Mizuno's from almost day one. They're the only shoe I can wear for more than 12 miles without getting blisters/injured. I may have to give these a try. Style does not matter to me one bit. It's funny as I'm not a heel striker either. 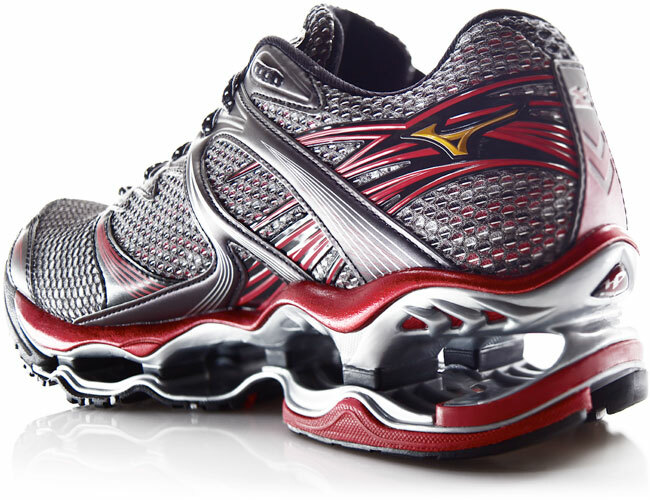 I've always wished Mizuno would come up with something more cushioned in the forefoot. I got to try a pair and they didn't work for me. I LOVED my mizuno wave riders, but the prophecy was too stiff. Then I went minimalist and they didn't work for me at all. That is a cool looking shoe. As for myself, can't say that I have bought a shoe based on design so far. Support and comfort are what sold me on my current pair. Good point David. I agree that is the most important when looking for a pair of shoes. Those shoes are definitely cool looking, but I'm more into comfort than looks. I'm still looking for the "perfect" shoe for me, which as a forefoot striker has definitely been a learning curve. Most shoes seem to be designed for heel strikers except for Newton's which didn't really work for me not to mention costing an arm and a leg. Haven't ever worn a Mizuno as they never felt comfortable at all when trying on. I'm wearing Nike Free Run right now but they're still not quite "right". I wish some of these shoes came in wide widths!! I always stick to my Asics GT-2160s..... but would be willing to try a new pair that looks fab and fits! I looked at a pair of these in the store and they are very stiff. It seems to me that they would hurt just from the stiffness. I am with you - style really doesn't matter to me either, but I do like a good looking shoe. However, not at the expense of functionality or comfort. I would be very careful moving to these if you are not a heel striker. These shoes definitely look to be designed that way, especially in the flesh. look to be designed that way, especially in the flesh. I know your pain with needing a wide shoe. I don't need a real wide shoe, but some shoes are just cut to narrow for a good feel.